But tonight’s the Mad Men 2014 finale. And I’m kiiiinda losing it. Mad Men has a weird place in my heart because it’s the first show I’ve been devoted to for years on end. With the exception of perhaps 5 episodes (finals were happening, and then Netflix eliminated that season), I’ve seen it all. I’m rarely ever a fangirl for something, but I am a Maddie through and through. A good chunk of my adult life have been trying to figure out why I love this show. 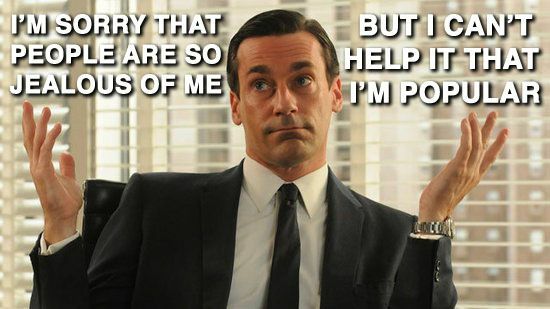 This is the best reason I’ve come up with: Mad Men is the only show I can watch with regularity that makes me nervous. The issues portrayed on this show are immediate. They’re here, in the present day. We see echoes of them all over. You can’t take any section of MM and conscript it as a morality play. Life’s not like that, and neither is this show. Take the show’s treatment of hippies. I can’t say it’s true exactly because I wasn’t there in the 1960’s, but the attitude toward hippies is 100% believable. They’re partly admired for being on the edge and speaking about social issues no one will discuss (also, check Megan’s apartment for how much influence they influenced style). But in terms of living an actual hippie lifestyle? Hell to the no. People would rather stay in their conventional, capitalist lives because it’s what they know. Even if they’re miserable, even if the younger generation refuses the choice kicking and screaming. During my college years, our hippies were the Occupy Wall Street protestors. God, how I romanticized those folks. At 20 years old and living in a co-op, I loved the concept of Occupy. Finally, people my age were getting angry enough to say something! Finally, people were expressing their feelings of helplessness and fury at The Man! But I couldn’t make myself join the movement. Something held me back. Something was preventing me from being the cool hippie that I wanted to be, and I realized that it was because I had a place in my social environment. I was “allowed” to be the androgynous writer who was waiting to have children. Most people who become hippies at young ages feel that they aren’t allowed to be the people they are. It was a hard pill to swallow that the ability to be yourself in your native environment is in fact a privilege. Not everyone becomes a hippie because not everyone has to fight to be who they natively are. Not everyone is emotionally stifled and seeking a means of escape. Also, not everyone feels societal pressure to marry and breed immediately after college. Ironically, the people who do best on MM are the ones that are most honest about their struggles against the machine. Roger is one of the most beloved and emotionally stable characters on the show because he’s honest about every one of his hedonistic urges. Same with Joan, that poor conflicted woman. As the old dichotomies die down with the 1960s (madonna vs. whore, business man vs. family man), the best characters are the ones that find themselves somewhere in the middle. That’s what made this last season so exciting—who was going to grip on tightly to the past, and who would resign themselves to a new place in the brave new world? This show is about growing up, which explains why I was attracted to it so much during college. But this show is so far the most honest show I have come across in terms of what growing up is actually like. There is no grand map of adulthood. So-called real adults who have jobs and families can still eff up fantastically. And more often than not, kids offer the most impartial view of what’s going on in the world. I’ll miss Mad Men because it’s the show that showed me that adulthood doesn’t have to be just one thing. It can be a wonderful, endearing experience or a pile of sh*t, depending on how honest you are with yourself about what you want. It will be sad to see it go. 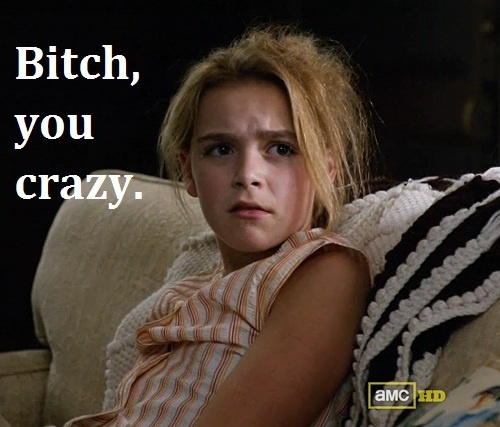 Also, Sally Draper is a paragon of womanhood. We should all aspire to be like her.